Whether you’re starting a new business or relating, purchasing commercial property outside the U.S. can be a wise investment; however, you need expert trans continental real estate companies or brokers at your side to ensure that the investment leads to the one thing that all commercial real estate investors care about: profitability. With that drive for success in mind, many have begun to look overseas for qualified investments. The reasoning is three-fold: 1.) running a business overseas will likely have cheeaper operating costs; 2.) you can move your assets to multiple locations; and 3.) it can be a nice retirement plan. Unfortunately, there are differences in buying trans continental realty, as compared to domestic property; one wrong move (such as choosing the wrong trans continental real estate company) can spoil your investment. Read on to find out how to make your quest easier and what to look for. If you’ve ever invested in commercial property domestically, you likely trusted your gut and used your instinct to make a final decision. The same is needed for overseas investments. However, you might find that also adding some logic and practicality to the mix helps you reach that decision more smoothly. Gather the names of local trans continental real estate companies or brokers; start by asking for recommendations and also perform research. If you’re planning to hire a corporate moving company, they might be able to provide you with some referrals. Contact international real estate asociations. For example, you may be familiar with NAR for realtors in Columbus, Ohio; however, did you know that NAR also has an international division, called NAR Global? 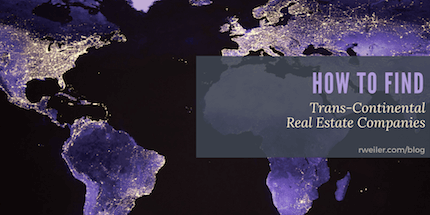 NAR Global can connect you with a network of qualified REALTORS® who specialize in trans continental real estate. They enfore an excellent code of conduct amongst their members, as well as provide a wealth of resources for those seeking professional help from trans continental real estate companies and brokers. And The International Consortium of Real Estate Associations (ICREA) is comprised of the world’s leading real estate associations. ICREA sets standards for international real estate practice, and they facilitate worldwide commercial real estate transactions, too. Learn about the commercial real estate certifications required in the country in which you are looking for property. Understand the currency conversions. With this knowledge, you will better understand the value of the property you are looking at; it will also help you determine whether you are getting a good deal. Research and compare commercial real estate company and broker fees in the country. This will help you set expectations and also go through your process safely and securely. Only hire a commercial real estate company or broker who is licensed. Look into brokers that have a Certified International Property Specialist (CIPS) designation. This designation is for REALTORS® from the United States and abroad who specialize in international real estate. Consider utilizing more than one real estate broker. You may find it more beneficial to hire a broker who resides locally, and therefore, understands the culture. Make sure the broker has commercial real estate experience in the area you are looking to relocate your business to. In addition to experence in CRE, find a broker who specializes in the specific commercial property type you are seeking. (This one is obvious, but figured we’d include it anyway.) If English is not the primary language of the country you are relaocting to, seek a bilingual broker who is fluent in the primary language of the country you are considering). Don’t be so quick to trust brand names or large commercial real estate companies. Ask for references… and reach out to them. Be precise when explaining your needs regarding the commercial property and location. The more information you can provide, the better you will be able to determine if they are a good fit. An overseas commercial real estate investment usually involves significant financial, tax, and legal matters. If you’re unsure of how to best navigate these areas, it’s important that you seek advice from qualified trans continental real estate companies, financial advisors, and real estate lawyers. Buying a commercial property overseas can lead to a great investment. However, with such a large capital purchase being in a place you likely are not very familiar with, caution needs to be exercised and advice heeded. Are You Overseas and Considering a CRE Investment in the U.S.? It’s important that you find a reliable partner to help you through the process. At The Robert Weiler Company, we have been helping commercial real estate investors in Central Ohio since 1938. Before you search for trans continental real estate companies, give us a call at 614-221-4286. Let us show you what our almost 80 years of experience can do for you and your business investment.